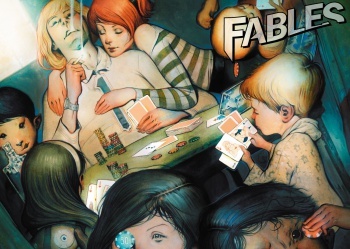 Bill Willingham's Fables appears to be the next comic book property slated to hit theaters as a big-budget Hollywood film. According to The Hollywood Reporter, the adaptation is being written by Jeremy Slater, a screenwriter whose only prior credit of note is the upcoming Fantastic Four reboot film. The director for Fables is a man named Nikolaj Arcel, a Danish auteur who's not well known outside of his native land, but did win acclaim for helming A Royal Affair, a Danish flick that was well-received in its home country. Beyond that, we know precious little about the Fables adaptation. The film is still in the extremely early planning stages, and as such the people behind it have not cast anyone in any roles, nor do they even have an estimated release date for the flick. Assuming everything goes to plan, we'd expect the movie to emerge in 2015 (most likely during the summer), but any number of factors could delay or speed its arrival. While comic book fans will recognize Fables as one of the most imaginative, genuinely excellent comic book series out there (at least until the Adversary confrontation). It somehow manages to blend dozens of characters from international folklore into a cohesive world that is at times as mundane as our own, and at times as fantastical as anything seen in any of DC or Marvel's superhero books. It's so good that Telltale Games is adapting Fables for a videogame in much the same way it did The Walking Dead (and we don't need to remind you of how that project turned out). Here's hoping that both the game and this new film adaptation turn out as well as Telltale's Walking Dead. In the meanwhile, we'll bring you any updates as they emerge.